I’m a big fan of an evening tipple to cap off my day: a bottle of beer or glass of wine with dinner, a highball while watching TV, a cocktail with friends. Often, however, it’s not the right time or situation for alcohol: I’m on antibiotics, I’m hanging out with friends in recovery, I’m doing detail work, whatever. In those situations there are, of course, a whole panoply of nonalcoholic drinks available. It’s not as if we’re at a loss for beverages that happen not to contain alcohol. Sometimes, though, my desires and my circumstances come into conflict, because I’d really like a nice bracing cocktail, something rich and spicy and bitter. (When it comes to liquors, I gravitate toward the browns: rums and bourbons and scotches, the darker and funkier the better.) This becomes a problem, because if you go traipsing into the land of mocktails, it’s mostly sweet and pastel-colored. And that’s really great, if you like sweet, fruity drinks — but I don’t. And while the field’s not entirely barren, the list of mocktails-for-people-who-like-whisky is pretty short, especially compared to the scores of fruit-juice-and-fizzy-water drinks out there. And so I started trying to make my own. I thought about the characteristics of whisky — what makes it whisky in flavor? There’s some smoke, some sweetness, a woody background, sometimes even a hint of floralness. But it’s all cloaked in a bite and a burn. I had some dead ends along the way. I can tell you that liquid smoke, while it seems like a smart idea, pretty much always ends up giving a weird hotdog note. Vinegars aren’t bad, per se, but they always end up tasting a bit like a wine cocktail or a shrub: interesting, but wrong. Vanilla’s just really strong, and though it’s a valid flavor component in whiskies, unless you’re batching something up it’s really hard to get its concentration low enough to not be overpowering. What does work? Well… maple syrup’s in there. Not surprising: it’s subtly sweet, woody, sometimes even smoky. Pomegranate molasses is in there too, giving some sharpness and body to the whole thing. The dark horse, though, is sweet soy sauce: thick, salty, sweet, a little musty. When I mentioned this to friends, many were concerned: doesn’t it taste like, well, soy sauce? But it doesn’t! Instead, it adds a richness to the drink that really brings it together. The other magic elements are a good amount of woody herbs and peppercorns, steeped in boiling water to make a strong herb extract that makes the whole thing aromatic and slightly spicy. Combined with some tonic water and a big wedge of lemon, it’s a little bitter, a little sweet, a little astringent, a little sour, and a whole lot tasty. Drink with good cheer, and enjoy the sunshine with a bracing drink in hand — hold the alcohol. Finally: a mocktail for people who like whisky! 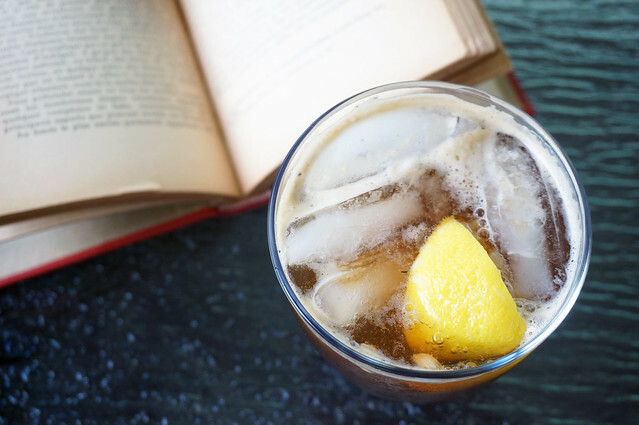 This drink combines a number of strong herbal flavors and complex natural sweeteners to make a drink that — though I’ll freely admit it doesn’t take like whisky — hits all the sensory buttons my tastebuds are looking for in a mixed drink. 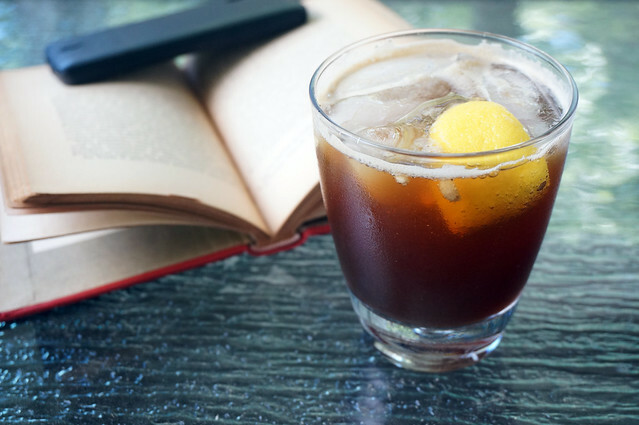 If you’re a brown liquor drinker, but would like to skip the booze this time around, this drink’s for you. A couple of the ingredients may be unfamiliar: pomegranate molasses is simply the concentrated juice of the pomegranate, and can be found at Middle Eastern stores (and increasingly in mainstream groceries). Orange blossom water is a very strong floral extract, also common in Middle Eastern preparations. Sweet soy sauce is a thick, sweet-salty sauce from Indonesia, also called kecap manis; if you can’t find it, the internet tells me you could probably get away from equal parts brown sugar and non-sweet soy sauce, maybe with a touch of molasses. 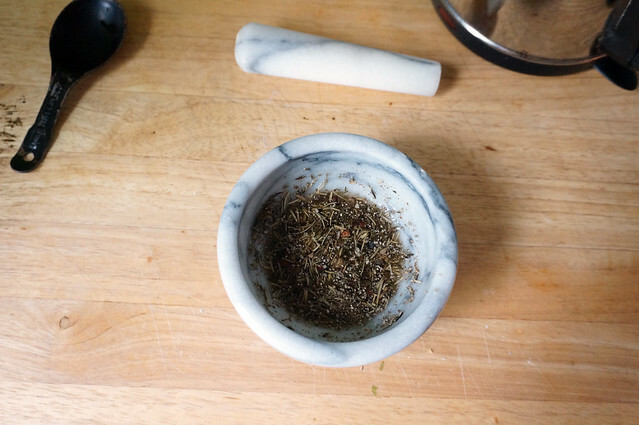 In a small bowl or ramekin, combine the herbs and pepper, and pour the boiling water over. Let steep five minutes, then strain off the liquid (discard the solids). Combine the herb-and-pepper water with the pomegranate molasses, sweet soy sauce, maple syrup, and orange blossom water. Divide evenly between two rocks glasses. Squeeze a lemon wedge into each glass (drop in the wedge afterward), add 3-6 ice cubes to each, and fill with tonic water. The orange blossom water adds a nice tinge of floral scent, but if you don’t have it around don’t sweat it; you can leave it out. With a small amount of ice this is a much more bitter and astringent beverage, because the tonic is more present. If you’d like it a little smoother, add more ice. You might also substitute soda water for some or all of the tonic — I personally find the drink a little bland with soda only, but trust your taste buds. This is intriguing. I’m not a huge whisky fan (or any of the “browns” to be honest) but this mix of ingredients sounds amazing – a bit weird, but sufficiently witchy to really interest me. Thanks for sharing. You’re very welcome; while it’s made to appeal to whiskey lovers, I think there’s plenty of room in this boat!